Charlesview Residences Gets “2014 Communities of Quality – Outstanding Turnaround of a Troubled Property Award” by the New England Affordable Housing Management Association. Charlesview, Inc. is dedicated to advancing the well-being of individuals and families and to promoting the diversity and vibrancy of the Allston-Brighton community. We do this by providing healthy, affordable homes; offering programs designed to enrich, educate and inspire; and engaging in innovative philanthropy. 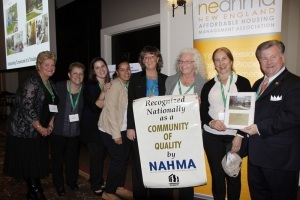 The NEAHMA Communities of Quality Awards honor the achievements of affordable housing providers who make an unprecedented contribution to developing outstanding properties for families of modest means. The COQ Awards recognize outstanding property-management companies that demonstrate the highest possible quality of safe, affordable housing for lower-income families at particular sites. Charlesview Residences in managed by Peabody Properties, Inc.